The Copper River is divided into two subdistricts for management purposes. 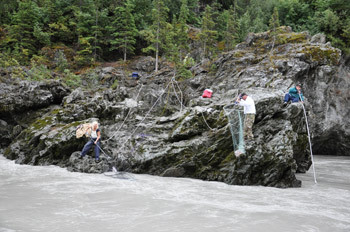 The Chitina Subdistrict is classified as a personal use fishery, and dip nets are the only allowable gear. The Glennallen Subdistrict is classified as a subsistence fishery, and either fishwheels or dip nets are allowable gear. Users may participate in ONLY ONE of these two fisheries in any given year. The Chitina Subdistrict personal use fishery is restricted solely to the waters of the mainstem Copper River between the downstream edge of the Chitina-McCarthy Bridge and Alaska Department of Fish and Game regulatory markers located on an east-west line crossing the Copper River about 200 yards upstream of Haley Creek (in Wood Canyon). All tributaries of the Copper River in this area, including the Chitina River, are CLOSED to personal use fishing. Under the Copper River Personal Use Dip Net Salmon Fishery Management Plan (5 AAC 77.591), salmon may be taken in the Chitina Subdistrict from June 7 until September 30 only during periods established by Emergency Order. Emergency orders are issued during the season to adjust this schedule based on escapement estimates at the Miles Lake sonar. Information regarding fishery openings will be updated and posted here if changes are made by emergency order. The Glennallen Subdistrict subsistence fishery is restricted to all waters of the mainstem Copper River from the mouth of the Slana River downstream to the downstream edge of the Chitina-McCarthy Bridge. All tributaries of the Copper River, including the Chitina River, are CLOSED to subsistence fishing. Under the Copper River Subsistence Salmon Fisheries Management Plans (5 AAC 01.647), the Glennallen Subdistrict Subsistence Salmon Fishery is open continuously from June 1 through September 30. See the Copper River/Miles Lake Sonar salmon escapement numbers page for additional information. Not all private land is posted. Please respect the rights of private landowners. The road from O'Brien Creek to Haley Creek is CLOSED at Milepost 3.7. DOT has no plans to repair the road beyond this point. Remember: Littering carries a fine of $1,000. YOU are responsible for your trash. Please haul your garbage home and leave as little behind in the trash barrels and dumpsters as possible. Disposal of fish carcasses along the road and not into fast flowing waters that carry the fish into the Copper River is also considered littering and subject to the $1,000 fine!